Lama Tharchin Rinpoche (Wyl. sngags ’chang bla ma mthar phyin) (1936-2013) was a Dzogchen master of Vajrayana Buddhism. He was the tenth lineage holder of the Repkong Ngakpas. This is a family lineage of yogis, or householders, and was the largest community of non-monastic practitioners in Tibet. Lama Tharchin Rinpoche was trained in Dudjom Rinpoche's monastery, engaged in five years of solitary retreat and then completed the three year retreat with three others under the supervision of Dudjom Rinpoche. 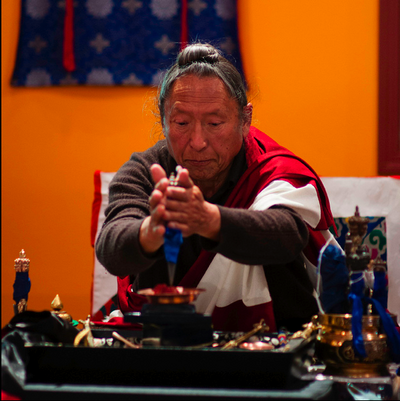 In addition to Dudjom Rinpoche, his main teachers have been his father Wöngtsang Chime Dorje, Chatral Rinpoche, Lama Sherap Dorje Rinpoche, and Dungse Thinley Norbu Rinpoche. He also received teachings from Shechen Kongtrul Pema Drimé Lekpé Lodrö. Rinpoche left Tibet by foot with his family in 1960. He lived in Orissa, India and Kathmandu, Nepal before coming to America in 1984 for health reasons. While in America, Dudjom Rinpoche asked Lama Tharchin Rinpoche to turn the third wheel of Dharma, the teachings of Vajrayana Buddhism. As a householder with two sons, Rinpoche had a wonderfully kind and wise approach to working with Western students. His gentleness and jewel-like qualities embodied a living expression of the wisdom and compassion of the Buddhadharma. He was recognised not only because of his great realization, but also for his vast knowledge of Tibetan ritual arts, music, and dance, as well as the philosophical basis of the Vajrayana teachings. This page was last edited on 7 December 2017, at 17:39.